Mars crust and earths crust are broken. Those crusts consist of tens of kilometers of rock. Why is this crust broken? How to break a rock? The way to do that is by generating a force that exceeds its breaking strength. There are two ways to do that: from the inside, or from the outside. If it would have happened from the inside, this would have been pressure. Once there is a hole in the crust, that would become the valve of the planet. There would be lots of volcanism there, and the crust would not break further. If it would have happened from the outside, it would break at any place where it got struck with a force that exceeds its breaking strength. Since we have found lots of craters in the solar system, the breaking of the crust could be related to impacts. To test this, we must calculate/simulation and observe. So above are the processes that could have played a role in crust breaking processes. At this point, there is no planet crust breaking calculation available. So either this has not been performed, or this could not be found by Geodetective. It is worth to calculate/simulate if the stated processes could be responsible for crust breaking and how much. Geodetective has not found much information about crust breaking at all. This means there is a big chance that crust breaking is not well understood in science. This also means that the consequence of crust breaking may not be well understood either. It probably has got a big influence on geology, so we may have discovered that geology is largely based on unknowns that have been filled up: geology is probably based on assumptions. Within geophysics it was claimed that plates only move on earth. Moving plates on mars are not well understood, but there is evidence that it occurred. See the image below. 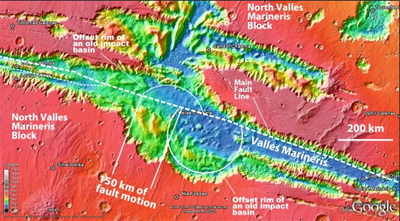 One of the conclusions from the reference where this image comes from, is they show “plate tectonics happened on mars”, because a crater shows evidence that it changed shape. The writer does not say that this crater could be (part of) the cause of the fracture and plate movement, but that could be the case. Click on the Mars image to enlarge it. You will see that it looks shattered. The standard interpretations of this, is (just like on earth) Plate Tectonics. Plate Tectonics explanation is based on the deep time assumption. Take a good look at it. It is not just one crack. With one slowly forming crack, the crust would not fracture this way, because the crack would be the weakest point and any more stress would just open the gap more, not shatter the crust further. So we can conclude that Mars crust broke quickly. That is not surprising: it’s rock. Rock does not break slowly. And if Mars broke quickly, it is not realistic at all that earths crust broke up slowly. This shows that the fracturing of the crust is probably related to impacts. Heating may still be another explanation, though the shape of the fracture makes it unlikely.